If you have ever wondered what goes on behind the scenes at a Gator football game — how they get the stats from the field onto the scoreboard, or why it takes so long to upload those gameday selfies during half-time — then you will be thrilled to meet Carly Hublou. Carly works for the University Athletic Association (a.k.a., The Gators) and serves as Director-At-Large for ACEL and the Editor in Chief of the ACELerator newsletter. Kevin: What do you do for a living? 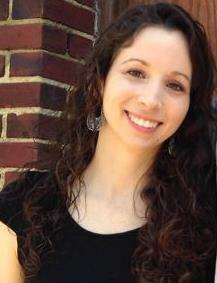 Carly: I am the program coordinator for the IT Department at the University Athletic Association at UF. Before that, I worked in construction contract administration, and before that, document production. I am also a part-time student in UF’s Hough Graduate School of Business studying for my Master’s in Information Systems and Operations Management. Kevin: What’s the best work story you can tell me? Carly: When I worked in construction, sometimes I had to go to job sites. 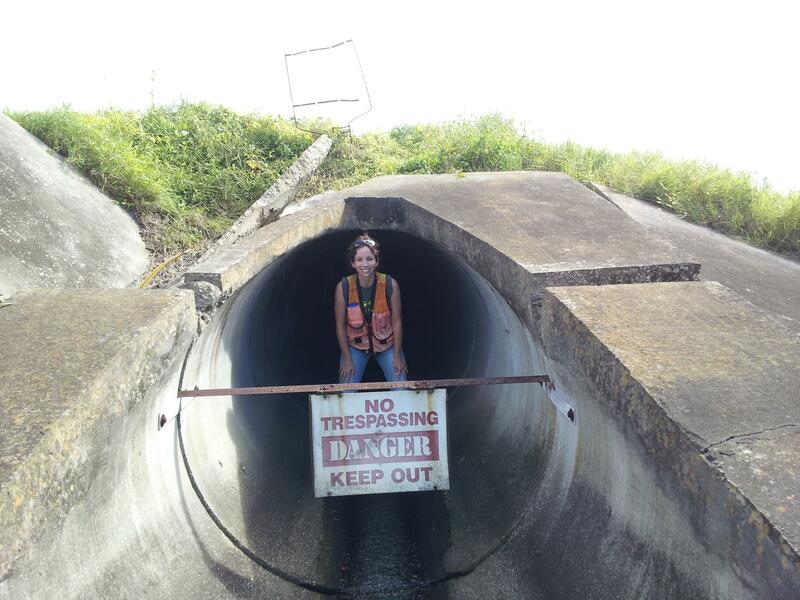 I’ve spent time in unfilled, multi-million-gallon, water-storage tanks, and I may have had my photo taken in a reclaimed water pipe that had a circumference larger than my height. As for UAA, my office is IN the football stadium, I get to attend sports for free, and I get all the perks of working for UF without the drama of being a state employee. (UAA is a private, non-profit that receives no funding from the state!) One cool project I got to lead was finding someone to take the 78 computers, 17 keyboards, 17 LCD monitors, and 3 boxes of miscellaneous cords we were no longer using. We ended up donating them to the Dignity Project, a local non-profit dedicated to encouraging self-sufficiency to members of the Gainesville community by helping fulfill transportation and computer needs for low-income or disadvantaged citizens. It was nice to be able to provide such a large donation to that cause. Kevin: What do you do when you’re not working? Carly: Graduate school has become a big part of my life, mostly because I said I was going to do a better job of it this time around. So that means lots of reading, studying, and meeting up for group projects, because business school is all about the group project. But outside of school, work, and ACEL, I like to hang out with my husband and dogs, play with power tools, hike, camp, play video games, and work on my yoga inversions. Kevin: How long have you lived in Gainesville? Carly: August 2015 marked my 10-year anniversary in Gainesville. It makes me feel old. School brought me here, and then, as much as I wanted to move to NYC like every other young Millennial with an English degree, I found a job here and started 3 days after graduating. I’ve been here ever since, save for an 8-month hiatus when I lived in Tampa for my husband’s job. Kevin: What’s your favorite thing about Gainesville? Carly: I didn’t realize this until I left GNV, but the best thing about it is the GREEN. Moving back here from Tampa, I had forgotten how green the city is. Our tree canopy is incredible, but I took it for granted until I was living in a concrete jungle like downtown Tampa, where you might not see a mature tree for miles. There is so much nature here and lots of ways to explore it, and I love that. My second-favorite thing is the food. GNV’s food scene is pretty incredible for a city this size. Kevin: What’s your favorite restaurant? Carly: Applebee’s. Haha, I don’t even have to tell you that’s a joke, right? But for real, that’s a tough question. I could name something for every food category. Can I give a top 5? Yes, I can. Bangkok Square (probably my fave), Sababa, Indian Cuisine, The Top, Leonardo’s (all of their concept restaurants). Kevin: If you were queen of Gainesville for one day, what would you change? Carly: Infrastructure! I would delete all of the suburbs and encourage live/work development within the city limits. The sprawl in Gainesville is terrible and so unnecessary. There are so many great homes here already, yet people want “new and bigger” homes to store all the things they buy but don’t really need. So they move out west. People complain about traffic in GNV, but then they choose to live 20 minutes out of town, where they can’t use public transit and can only choose a few major roadways to get out there. It’s really frustrating to me. Also, I would make people ride the bus, if only for a day. The buses are great, but I think people are afraid of them. I rode the bus to work for a year (by choice, not necessity) and it was one of the most interesting things I ever did. Carly in a 60-inch pipe in Largo, FL. Kevin: What’s something that everyone should know about Gainesville? Carly: It’s the best city in Florida. Relatively low cost of living, 2-hour drive from most major metropolitan cities in the state, great restaurants, big culture for a small town, all kinds of sporting events, 30-minute drive to camping and the springs, low crime rates…I could go on. Kevin: What’s your spirit animal? Carly: Since I’m a Gemini, I really have two spirit animals: The owl and the fox. Kevin: What do you do for ACEL? Carly: I am an at-large member of the Board of Directors. I also occasionally write articles for the blog, and I write/curate/publish the ACELerator, our semi-monthly e-newsletter. I have been a member for about 2 years now. I didn’t actually want to get involved. My husband forced me because he said I needed to be more social. (Just kidding…mostly.) I had had friends who had been members before I moved to Tampa, and when we moved back, we decided we needed to be more involved in the community and make new friends since all of ours were leaving or had left. I met a lot of cool people at my first happy hour, so I stuck with it. I really enjoy being a part of the Board and having opportunities to give back to and shape our community. Kevin: As a professional, what’s one piece of advice you can give me? Carly: Be patient. I think young people tend to want their careers and successes to happen overnight, but it just doesn’t work that way. I think Millennials have this unrealistic vision for themselves that they are special and thus deserve whatever they want or should succeed faster than the person next to them. Plus, we are surrounded by social media, through which we waste our spare time looking at what our friends are doing and comparing ourselves to them. We look to our friends to find our rank among the crowd, but because our friends mostly post only the positive things happening in their lives, we think that everyone else is living this exceptional life while we trudge on an average path. It’s hard to ignore the pull of bragging on social media. But the truth is, most people are in the exact same place as you. So be patient. You’re not going to be a CEO overnight. You may never actually achieve anything until you’re 45. And that’s OK, because life is not a competition for likes on Facebook or hearts on Instagram. It’s a journey, and a very personal one. Learn how to network and how to leverage that network to pursue your goals. It’s cheesy and has sort of become a buzzword, but it’s true. You know that saying, “It takes a village to raise a child”? The same is true to build a leader.